When I was young, back in the last century before video games and feminism were invented, a popular board game was The Barbie "Queen of the Prom" Game, below right. Described as "a fun game with real-life appeal for all girls," it was pretty much what you'd expect: the pursuit of boyfriends and fancy dresses, with the ultimate goal to land one of the hot guys – Bob, Tom, or Ken, and avoiding poor ginger Poindexter with his ink-dot eyes – as your date for the prom, where you hoped to be crowned QUEEN. My friends and I thought it was way cool. 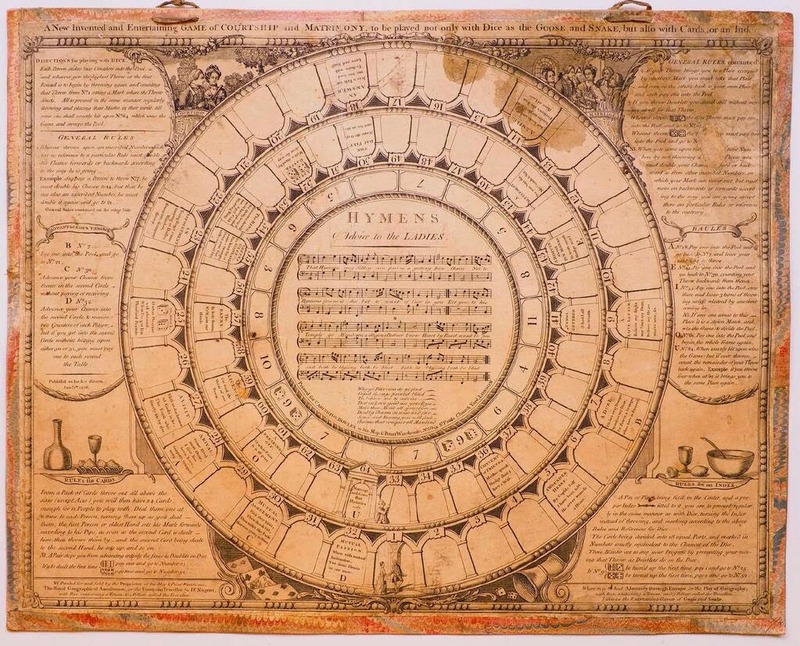 A rare and interesting board game for young women, taking the players on a journey through courtship, engagement, and, finally, marriage. On the way are a first kiss, a first argument (over money), a duel, a visit to the vicar, a short-cut to Gretna Green, breaking off, and so on. I've also spotted spaces on the board labeled The Ring, The Bann, The Licence, An Offer, Mutual Passion, An Answer, A Settlement, A Love Letter, and A Wounded Heart. No mention of avoiding Lord Poindexter, however. Certainly it's all much more thrilling than Barbie's prom, and much more expensive, too. 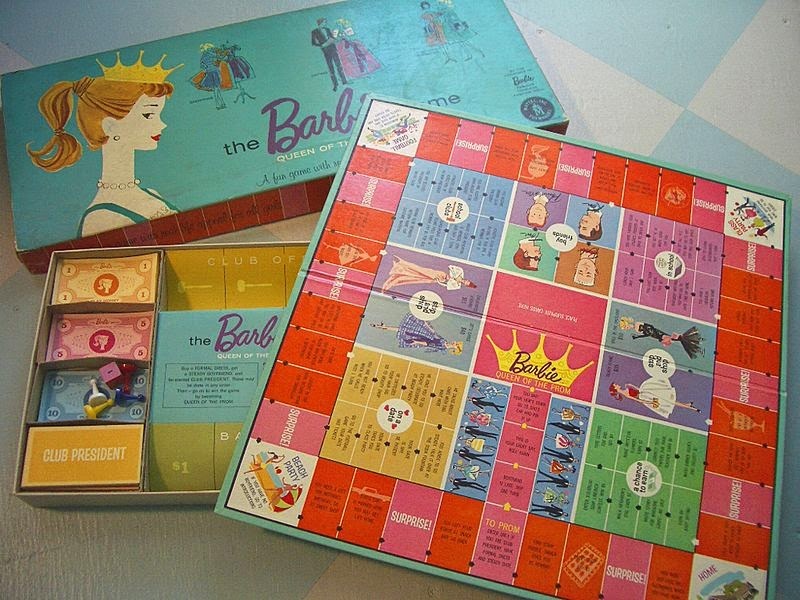 A vintage 1961 copy of The Barbie Game can be had on eBay for under $100, while the asking price for the one-of-a-kind Advice to the Ladies is £1800. Hope that Settlement is a good one! 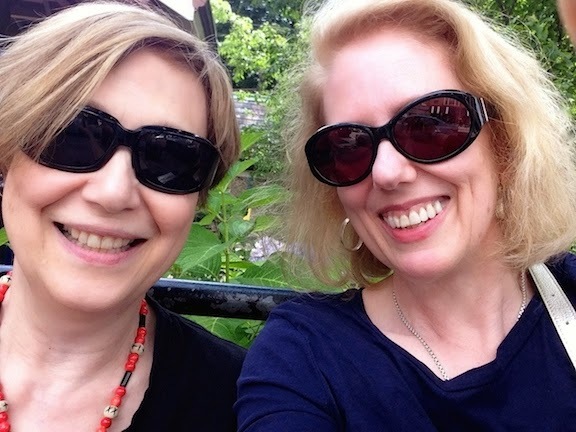 Many thanks to friend of the blog Mitch Fraas, Scholar in Residence, Schoenberg Institute for Manuscript Studies, University of Pennsylvania, for sharing this game first on Twitter. Mitch has assisted us with blogs before - see here and here. How marvelous! The entire catalogue is filled with wonderful things. In addition to the delightful game, I'm especially intrigued by the handbills for the airship, balloon ascension and parachute descent. Thank you so much for sharing! Oh, shoot, why did Mattel have to name the nerdy guy "Poindexter"?? The Poindexters came to the Virginia Colony from the Isle of Jersey, way back when, and the first to arrive was responsible for bringing the first Jersey cow to America. HUGE number of descendents (of the Poindexters, not the cows). The name translates "right hand", indicating someone who's not sinister (I know, bad pun), but it seems to be a favorite with pop culture instigators to indicate general - well, nerdiness. Otherwise, this is a fascinating post - some things never change.